EDITOR’S NOTE: Updated at 10 p.m. EST on Dec. 11 with one-day launch delay. Ready to double its Florida launch capacity with two pads, SpaceX is preparing to loft a reused robotic cargo ship toward the International Space Station Wednesday with a recycled Falcon 9 booster, debuting a rebuilt launch complex knocked offline more than a year ago in a fiery blast during pre-flight testing. The launch, set for 11:24 a.m. EST (1624 GMT) Wednesday, will be the first from Cape Canaveral’s Complex 40 launch pad since August 2016. The seaside launch facility, leased by SpaceX from the U.S. Air Force, was damaged when a Falcon 9 rocket exploded there Sept. 1, 2016, leaving toxic debris and mangled metal strewn across the pad. 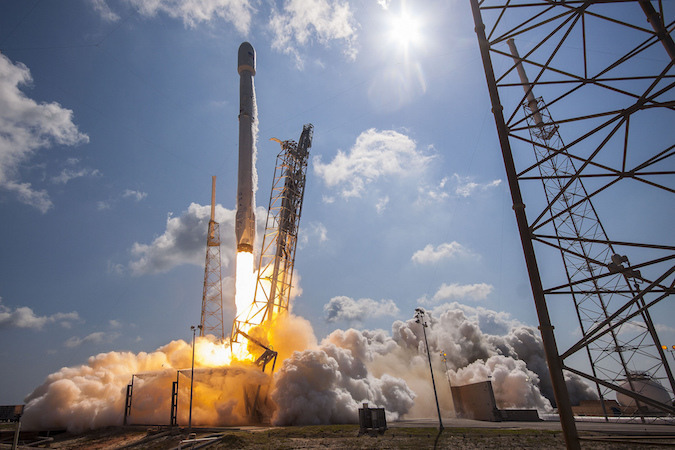 SpaceX resumed Falcon 9 launches early this year, basing its flights from launch pads at NASA’s nearby Kennedy Space Center and Vandenberg Air Force Base in California. The company’s engineers traced the failure to a ruptured pressurant container inside the Falcon 9’s second stage liquid oxygen tank. Construction crews prepared KSC’s pad 39A, which SpaceX had already leased from NASA and modified from its space shuttle layout, to accommodate Falcon 9 flights this year, then turned their attention to repairing and upgrading pad 40. Pad 40 lies a few miles to south of pad 39A on Air Force property, sandwiched between launch facilities operated by rival United Launch Alliance. Originally built in the 1960s for the Air Force’s Titan rocket program, Complex 40 hosted its last Titan 4 launch in April 2005. SpaceX took over the pad in 2007, then launched the first Falcon 9 rocket there in June 2010. Muratore told reporters Friday that much of pad 40’s equipment and design was antiquated, some of which dated back more than 50 years to the dawn of the Titan era. Engineers also found some of SpaceX’s own hardware at pad 40 was outdated because it was based on the original Falcon 9 design, which has been replaced with several upgraded versions. “Having had 30 or more missions under our belt when we started this redesign, we’ve been able to take advantage of all those lessons learned and integrate them into the pad, and then also taken in what we’ve learned from pads we’ve designed at 39A and Vandenberg,” Muratore said. After picking up the pieces left over from last September’s explosion and completing an environmental clean-up, workers stripped away wiring, concrete and other support infrastructure down to the pad’s foundation left over from the Titan era. Repairs and construction kicked off at full speed in February, according to Muratore, a former NASA engineer and a veteran of the space shuttle program. The work to bring pad 40 back to service cost around $50 million, he said. The thrust of the changes at pad 40 were aimed at making the launch complex more automated and more resilient, an end that should result in more efficient launch operations and faster turnaround times between missions, he said. The new reinforced structures at pad 40 should last many years, he said. SpaceX installed a new water suppression system to prevent damage to the flame trench, which directs red-hot rocket exhaust to the east from the pad at ignition. Muratore said SpaceX struggled with heat and pressure damage in the flame trench, which often required rework between flights. SpaceX conducts hold-down firings before every launch, using the test as an opportunity to check the readiness of the rocket, the launch pad and the launch team. 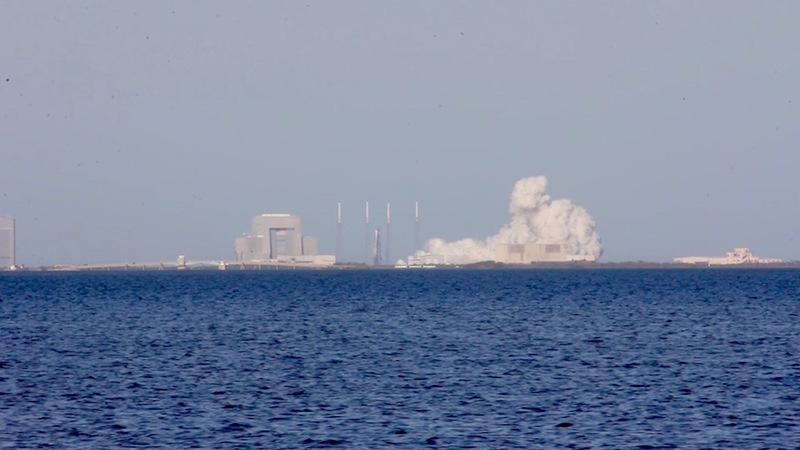 Most of the Falcon 9’s static fire tests have run around three seconds, but the firing accomplished before the upcoming space station cargo launch lasted seven seconds, thanks to the beefed up water supply. Another big change was the construction of a new transporter/erector, the structure that holds the Falcon 9 rocket during rollout from its hangar, then hoists the launcher vertical. The new transporter/erector’s strongback structure, which runs the length of the rocket and supplies propellant and conditioned air to the upper stage and payload shroud, can withstand stronger winds than the earlier model, Muratore said. The base of the transporter/erector, called the launch mount, features hold-down restraints that will retreat into turret-like “doghouses” at liftoff, shielding the sensitive hardware from blast damage. The strongback will retract away from the Falcon 9 at liftoff, a procedure SpaceX calls the “throwback” maneuver. 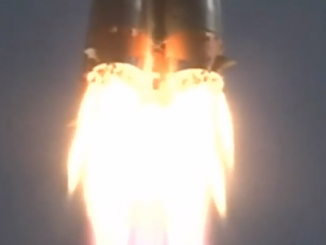 Pad 40’s previous strongback retracted to angle around 20 degrees from the launcher in the final minutes of the countdown, then stayed in that position through liftoff. The doghouse setup and throwback maneuver are similar to the design employed at pad 39A. “We’ve really worked to make the pads common,” Muratore said. Pad 40’s new transporter/erector can raise the Falcon 9 rocket upright in as little as five minutes, Muratore said, an improvement from the half-hour needed to erect the booster using the facility’s previous equipment, thanks to a new hydraulic actuator design. Other upgrades made at pad 40 included a rebuild of the liquid oxygen densification system, a network of pumps and chillers that cool the cryogenic fluid close to its freezing point. The Falcon 9 burns super-chilled densified kerosene and liquid oxygen, allowing the rocket’s tanks to hold more propellant and its engines to generate extra thrust. 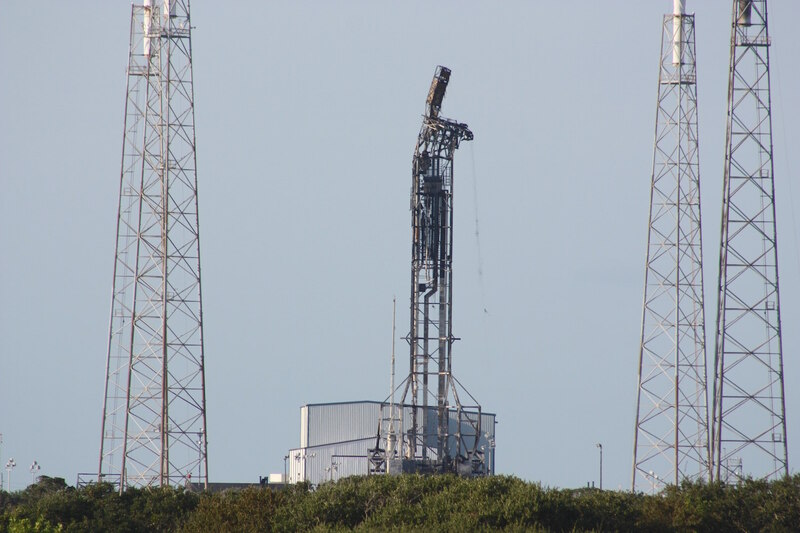 Muratore said the new liquid oxygen densification system can re-chill propellants drained from the Falcon 9 after a scrubbed countdown, allowing back-to-back launch attempts at pad 40. Technicians also added new fiber-optic data lines and routed new wiring using nodes, instead of connecting wiring at a central hub under the pad. In the future, SpaceX plans to base launches of its Falcon Heavy rocket — made with three Falcon 9 first stage boosters bolted together — from pad 39A. When the company’s human-rated “Dragon 2” capsule is ready to fly astronauts, it will also take off from pad 39A. The Dragon 2 spacecraft will also be outfitted for cargo deliveries, and those missions will also depart from pad 39A because it requires unique ground support equipment installed there, Muratore said. Launches from Vandenberg go into polar orbits, a destination impossible to reach from Cape Canaveral without flying over populated areas. The automated equipment and reinforced structures now at pad 40 could allow Falcon 9s to take off there as often as once per week. 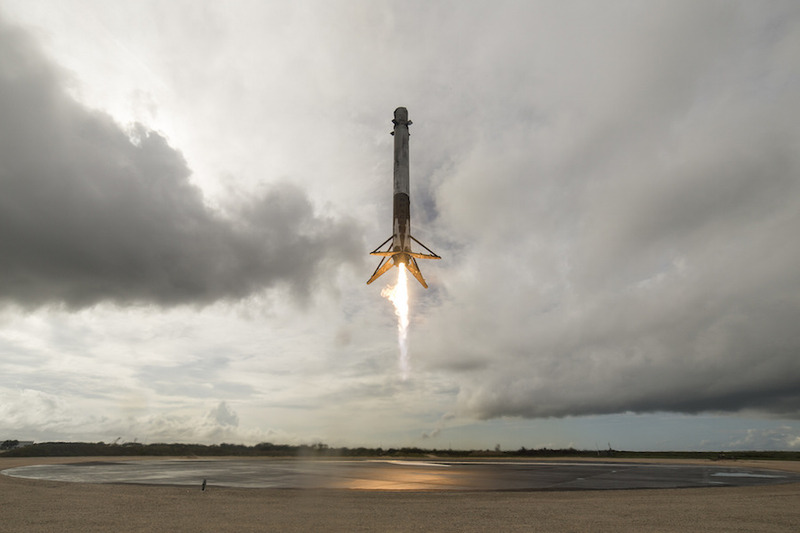 SpaceX’s quickest launch-to-launch turnaround on a single pad to date has been 12 days, but ground crews readied pad 39A for a static fire test in June just six days after the previous liftoff. Muratore said the rebuilt pad 40 is the third remodeled launch pad SpaceX has activated this year. The company upgraded its Vandenberg facility with new propellant densification systems for a launch in January, then launched service from pad 39A for the first time in February. It took a few months longer to get pad 40 back to launch-ready status than SpaceX originally planned. “I think we could have gotten the pad back to operation sooner, but we wouldn’t have had a pad we wanted to keep for the next 20 or 30 years,” Muratore said. Wednesday’s launch from pad 40 will begin a three-day trek for SpaceX’s Dragon cargo capsule, loaded with 4,861 pounds (2,205 kilograms) of supplies and provisions for space station’s crew. The mission will be the first carrying NASA cargo to use a re-flown Falcon 9 first stage, and the second with a reused Dragon cargo module. SpaceX has launched reused boosters three times before, all successfully, with commercial communications satellites. Kirk Shireman, NASA’s space station program manager, said agency engineers reviewed the risk posed by a recycled rocket and found it comparable to the risk of any rocket launch. 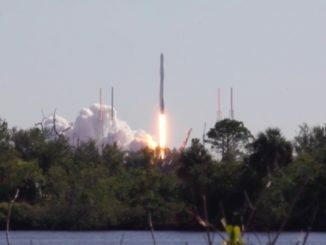 “We engaged rocket experts from around the agency to, first off, find what NASA would like to see in terms of data, analysis, testing and even inspections in between the flights, and then we met with SpaceX and reviewed what they did, and we’re very comfortable that the risk posture on this vehicle is not significantly greater than a new booster,” Shireman said. SpaceX replaces some components of its reused rockets between missions, but the tankage and engines remain the same on the first stage assigned to Wednesday’s mission. NASA will conduct a similar risk review before agreeing to fly station-bound supplies on a reused booster in the future, Shireman said, adding that the agency’s decision is, so far, specific only to Wednesday’s launch. 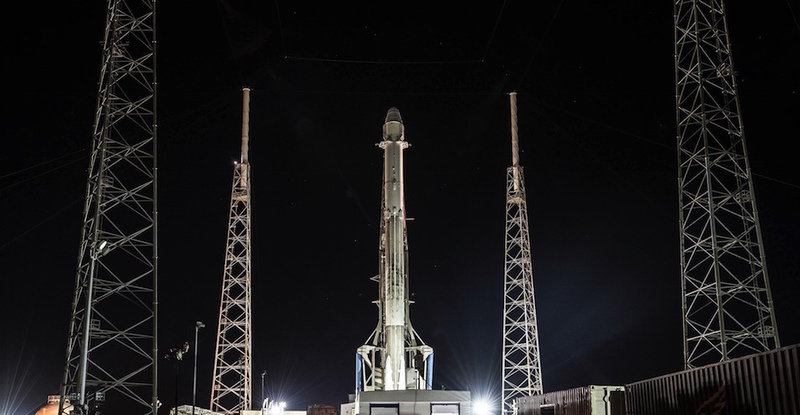 The first stage slated to fly Wednesday first launched with a Dragon cargo capsule heading for the space station June 3, then landed at SpaceX’s recovery pad at Cape Canaveral Air Force Station. The rocket’s first stage will follow the same profile on Wednesday’s launch, burning for nearly two-and-a-half minutes, then flipping around to descend back to Cape Canaveral, firing a subset of its engines for three steering and braking maneuvers before touchdown. Observers can expect a loud sonic boom as the rocket returns to Florida’s Space Coast around eight minutes after blastoff. The Dragon cargo capsule is also making its second trip to the space station, after a logistics delivery in April 2015. Assuming it lifts off Wednesday, the spaceship should arrive at the orbiting research complex early Saturday. SpaceX hoped to launch Tuesday, but the company stood down launch preparations late Monday to allow additional time to complete checks on ground systems, officials said. 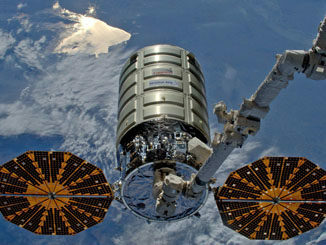 The cargo load includes two NASA-sponsored experiments to monitor the sun’s energy output, a key driver of Earth’s climate, and measure the density and distribution of space junk in the space station’s orbit. Both experiment packages will be mounted outside the station with the lab’s Canadian-built robotic arm. Also on-board: A habitat containing 40 mice to be used as research subjects for scientists investigating the efficacy of a drug delivery system for patients on Earth with muscle atrophy, a miniature blood glucose monitor that could be used by people with diabetes, and two commercial investigations from Budweiser that will study how the microgravity environment on the space station affects barley. And the astronauts can expect a few treats, and perhaps some holiday gifts. But that’s a surprise for the crew. “I cannot confirm or deny the presence of Christmas presents on-board Dragon,” Shireman said. The commercial cargo craft is scheduled to depart the station Jan. 13 and splash down in the Pacific Ocean with research specimens for analysis by scientists around the world.